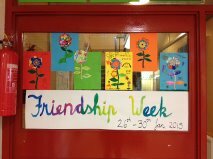 The 26th-30th of January 2015 was Friendship Week here at Scoil Naomh Micheál. 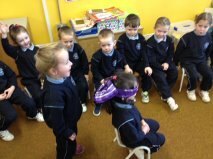 The Junior Infants participated by having a Friendship Chart where children worked on being good friends to each other. 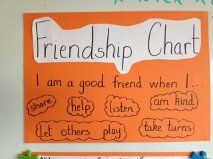 We all agreed that good friends should share, take turns, let others play, help, listen and be kind. 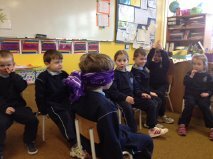 After small and big break, and throughout the day, the children reported incidences when they saw other children being a good friend. This created a very positive atmosphere in class. On Friday our class had the opportunity of making ‘friendship flowers’ with their big buddies from third class. Third class then joined us for free play in the yard. 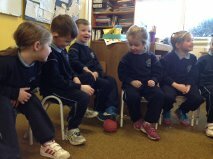 We also had some circle time as part of our SPHE lesson this week. We played three friendship games that required cooperation and turn taking. We are a very friendly class!